Farmers usually plant their crops in circular fields because the irrigation process is much more efficient that way. But most plots of land are rectangular, begging the question how can circles fill a rectangular plot of land most efficiently? 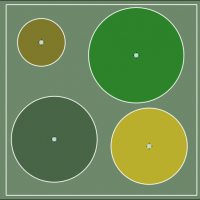 This app lets you experiment with different configurations and sizes when using four crop circles to cover a square plot of land. The rules: all four circles must be entirely contained within the square, and the circles cannot overlap each other in any way (obviously). The total area of the four circles combined is calculated at the bottom so that you can easily determine which configuration is the best without manually calculating the areas of the circles.